Bass fishing lures hold a special attraction for me. They cover walls and fill plastic organizer boxes in my Bass Bum™ Tackle Lounge and and my boat. Whether wood, hard or soft plastic, metal or a combination thereof I love all freshwater fishing lures. Remember, "getting there", that is, preparing for and actually engaging in the activities of utilizing your fishing skills and equipment, is "half the fun" of "catching". 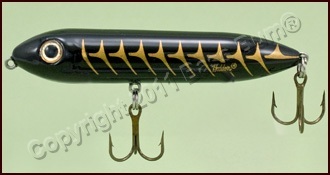 That includes all types of fishing lures. For several reasons, these are probably the favorite of pros and amateurs alike. These lures have life-like action in the water, they are life-like to the bass' sense of touch so tend to result in a bass holding on a bit longer, they can absorb scent and they can be made quite weedless when properly rigged. The original soft plastic bass fishing lure? Probably plastic worms whose initial popularity began in the 1960's. Today there is every imaginable configuration and color made. Some are remarkable imitations of forage while others look like characters from the bar Luke Skywalker walked into in Star Wars. Remember those guys? Today there are great craws, lizards and minnow imitations as well as "creature baits", like the things from the bar. There are a great many commercial manufacturers of plastic lures and even more "garage shops" making "homemade" plastic lures, an extremely popular and enjoyable hobby. Soft plastic bait material makes great bass fishing lures for largemouth and smallmouth alike. They're well suited for use in weeds and grass, brush, laydowns, rocky areas and even smooth bottoms. They come in lengths from 2 1/2" to more than 11". The color choice is mind boggling and though important in certain situations, is probably more important to the angler than to the bass. The variation of hooks for soft plastic fishing lures is equally overwhelming but the right choice can mean the difference between a successful day "catching" and on that's just "fishing". There are many "techniques" and "rigs" for fishing plastic lures making them extremely versatile. They are most often viewed as "warm water" lures and though successful bass catchers in warm water they should not be overlooked in cold water. Fishing plugs for subsurface fishing abound. This category of bass fishing lures includes crankbaits, minnow baits, vibrating plugs and jerkbaits. There are models for fishing shallow, deep and in between. The key to success is to get the lure to hit the bottom or bump some cover when being retrieved. This idea gives many of us shivers when we think of those treble hooks but bouncing them off logs, stumps and the like is not usually a problem as the bill serves as a deflector. You might, however, avoid dense bushy cover. Though this group of plugs can be fished year round they are best at water temperatures above 50°F. If retrieved slowly they will still catch bass in cold water. Crankbaits have either fat or thin, round or flat bodies and lips that cause the lure to dive and wiggle side to side while during retrieval. The bill length and width determine the depth the plug will dive and the tightness of its wiggle. Some will "suspend" while others sink. They are most often 3" to 6" in length. 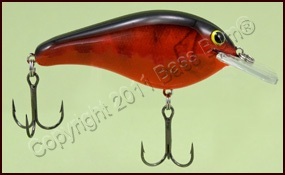 Minnowbaits are long, slim plugs that also have bills like crankbaits. They tend to be more realistic in appearance and action than many crankbaits and are favored over crankbaits by those of us that fish clear water often. Minnowbaits also tend to be better producers in cooler water. Jerkbaits are like minnow baits except that, unlike minnowbaits which are retrieved with a steady manner, they are retrieved with jerk and pause motions and target deeper bass. They are a good choice except in the middle of summer and the dead of winter. You'll find stickbaits, prop baits, chuggers, crawlers, buzzbaits and even some soft plastic baits in this group of bass fishing lures. They hold the promise of very exiting, smashing strikes unlike any others an angler may ever experience. There is nothing else quite like the explosive eruption of water from a bass viciously attacking your top water fishing lures. Topwater fishing lures work best in water temperatures above 60°F in the early morning and late afternoon hours of the day. In general, topwaters become effective during the post spawn period when the water temperature moves into the 60°'s and continues through summer and fall till the water again drops. They're great for working shallow banks in spring and summer and the "jumps" in the fall. 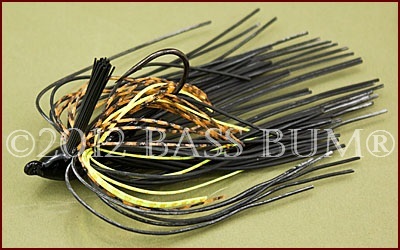 They're also one of the most exciting bass fishing lures on which to catch bass. The jig is an extremely versatile bass fishing lure. It can be fished deep, shallow, in heavy cover, be it brush, trees or rock and in almost any water temperature or season, with summer being the least productive time. It has a reputation for catching bigger bass and a high "hook up" ratio to number of bites. This may well be true in the hands of an experienced jig fisherman but recognizing when a bass has your jig can be difficult. Beside the fact that pickups are often light, a bass can and often does spit out a jig in an instance after detecting the unnatural hardness of the lure. Scents are very appropriate when using jigs as they can cause a delay in the bass ejecting the lure just long enough for an angler to feel it and set the hook. Using a jig successfully requires focus and a sensitive touch. Another thing, these bass lures will get hung up if you so much as hold your mouth wrong! Nevertheless, if an angler will devote the time to learn how to fish a jig it will become an important part of their arsenal for catching bigger bass. Swimbaits are bass fishing lures that have expanded the reach of bass fishermen into water depths never before attainable. They allow an angler to get "down deep" where the biggest, smartest bass hide out. They also come in shapes and sizes that will catch bass, often big bass, at all levels of the water column. Swimbait lures look and act the part of real forage fish, especially when in the hands of a skilled bass fisherman. Swimbaits are made from plastic and sometimes wood. They are sometimes works of art replicating real forage in exact detail. Unfortunately, these sometimes also seem to have a cost that you would expect to see at the Louvre in Paris. 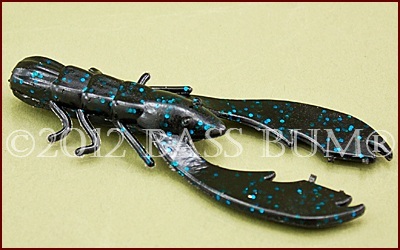 Fortunately, they are also swimbaits available at very reasonable prices. Swimbaits come in sizes from 3" to 12", jointed and not jointed and at weights from less than 1/2 ounce to more than 6-8 ounces. When fishing the heavier models special heavy duty rods and reels must be used. Yet, there are those that can be fished with "standard" gear very successfully. Click here to find out more about swimbaits and how to rig and fish them. The bottom line? Swimbaits catch bass, often big bass, and there are effective swimbait models available for all pocketbooks and levels of commitment. 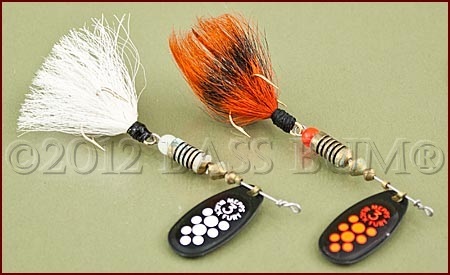 So don't pass this family of bass fishing lures by. They do what they were designed to do, catch bass! 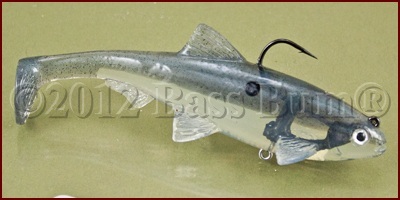 The bass fishing lures some call "idiot proof" are great freshwater fishing lures. There are two types of spinnerbaits, "in-line" and "safety pin". The former is not anywhere close to weedless and is not suitable for fishing cover, especially heavy cover. It will clog up in grass and if you tie it directly to your line you will get hellacious line twist. They are better when attached with a ball bearing snap swivel. The latter is almost completely weedless because the safety pin shaft serves as a deflector against weeds, logs and brush. These are a bit more versatile than the in-line style. Safety pin spinnerbaits can be fished almost anywhere. They can be retrieved with a straight, steady action; you can helicopter them down bluff faces and even jig or burn them along the bottom. A very nice aspect of spinnerbaits is the ability to modify them "in the field" by changing out components to meet changing conditions. Just like the excitement of getting bit on a top water lure, having a bass come out of the water and grab a fly at the end of your noodle fly rod is about more fun than a man can stand! Though tied flies have not been considered bass fishing lures in the past more and more bass fishermen are getting acquainted with fly fishing for bass, especially smallmouth bass. There are also sinking lines and subsurface flies being used for catching bass on fly rods in deeper water. If you haven't tried it you're missing out on a great amount of excitement and fun. 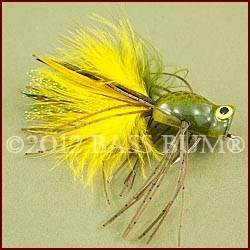 Check out the separate sections on fly fishing for bass for more information. Traditionally considered nothing but a lure for vertical jigging by bass fishermen, new designs and presentations are now changing that viewpoint. Spoons are made from metal, either steel or brass, and may have one concave side or be slightly rounded in the body. Depending on their specific design, they have wobble and flash that mimics the action of a dying or wounded baitfish more so than any other artificial lure. 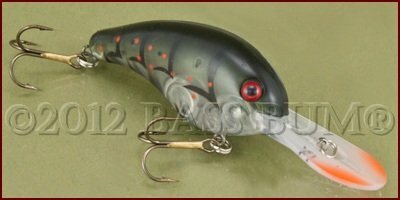 Historically not the first lure reached for by bass fishermen they have been seriously underused as bass fishing lures. Today, there is a plethora of designs that can be vertically jigged or even cast and then "cranked" back to the boat. 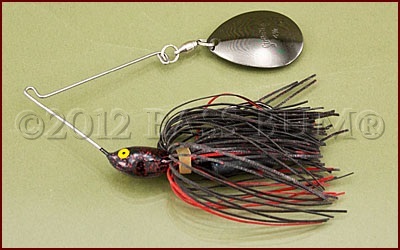 Today, savvy anglers consider spoons to be another member of their bass fishing lure arsenal. A Tube Has A Hollow Body Closed On One End With Multiple Tenacles On An Open End. How Do You Rig These Things? Bass Jig Anatomy, There Is More To Them Than Meets The Eye! How Do You Spell Excitement? Topwater Fishing! Crankbaits, Most of Us Fish Them Wrong! Bass Poppers - Topwater Excitement!